Before I get to the knitting I just want to say that we're fine here. Yes, there were some huge storms in our area yesterday, but most of the actual tornado activity went South and East of us here. We had thunderstorms, but that was it. We are very thankful that it didn't get any worse and the whole area is thankful that no one was killed in the storms yesterday. I saw your comments and got your emails last night and this morning, but we're fine here. It did make for an interesting afternoon and since the storms were right around afternoon school pick up, I was sent to a storm safe room with other parents. Fortunately, the room we were sent to also had 3 first grade classes. First grade teachers read stories during tornado warnings. (To the teachers' credit, there was not a single kid freaking out or crying about the storms. By the end, they were bored of sitting there, but bored is normal.) Where was Caleb and the other fifth graders? One of the girls bathrooms. They didn't get read to. I did get some knitting done yesterday and I actually finished my first mitt (minus the thumb - thumbs go last) for my April Knit Something of the Month project. I decided to make them fingerless mitts instead of fingerless gloves because fingerless mitts work better over rings. 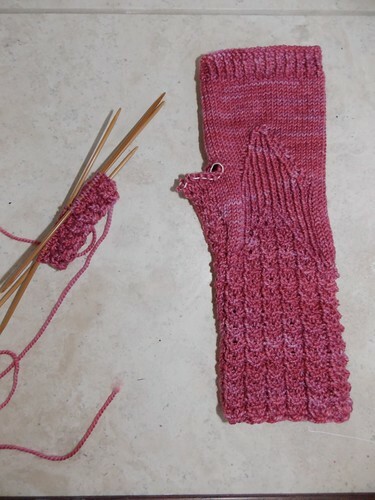 They are also faster to knit since you don't have to work each finger separately. I've started the cuff of my second mitt now, as you can see on the left of the finished mitt. Glad all is well. Tell Caleb 5th grade is the end of the "fun at school" year. That was the year we went from mid-morning and mid-afternoon recesses to only a noon break on the playground. :-( Sorry, Caleb. So happy to hear that you are all ok. Love the mitts you are working on.